* The newest addition to Tom Ford’s Private Blend line comes in a clear bottle – a stark contrast to the other dark black bottles. * The top note of Sandalwood is strong and peppered with spices, cinnamon, and cumin. This will definitely warm you up. 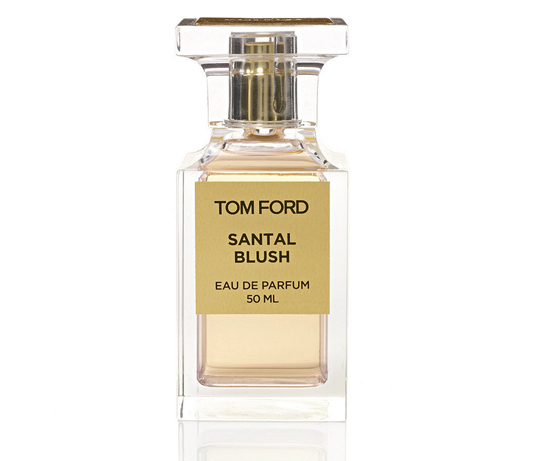 * As an Eau de Parfum concentration, Santal Blush is strong but not overbearing. It is office-friendly. * Rose and jasmin in the midnotes soften things up but the wood stays dominant. * The fragrance calms down after the first thirty minutes and becomes a skin scent. * The musk in the base is sheer and you will get a little bit of oud (agar wood), but it’s the sandalwood that is definitely the star.